Fennel is grown largely in Gujarat & Rajasthan. Growing season is During August and December. In India consumption of Fennel seed increases in the month of March to June. These days are generally hot, and Fennel seeds contain cool and refresher taste. 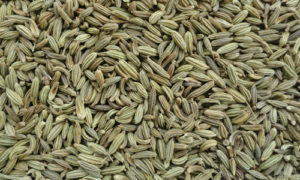 Indians have a Royal choice of having Sarbat of Fennel seeds which helps to bear, unbearable hot climate. Well known as Sauff. Indian Fennel is used in food, medicines, liquors, perfumery, also exported in the form including seeds, powder & volatile oil. The whole fennel seeds we make available in the market are procured from the natural sources and are absolutely free from any impurities. They are also remarkable for their high nutrition value. Acid insuluble ASH 1.25 % Max. Total ASH 10 % Max. Moisture 10 % – 11 % Max.